This book drew me to it for my love of trees grows stronger each time my eyes fall upon one of any kind. I always seem to find something new to admire about them. This exactly is what happens as I go through the seasons and trees’ changes in this stunning book, superbly illustrated by Charlotte Voake. Beautifully designed, there are two levels to the text. The large text tells the story in first person narrative, and describes why the girl character loves trees. Alliteration adds rhythm and sound whether read aloud or not. The smaller text is factual information which increases with the size of the trees. As the seasons change, the text extends to include the animals that nest in the trees, the work of the bees and the change in the foliage, bark and roots. How trees grow, what they draw on in each season to survive and how they appear - losing or retaining their leaves which change colour with time, is touched upon. Carefully worded to maximise the impact of the text, this gorgeous production could be viewed as a metaphor for life and the changes we inevitably undergo. The book begins and ends with the same striking end pages that wrap the contents in green leaves and branches, leaving the reader filled with wonder at the magnificence of trees. Children will surely look with added interest at every tree they see after this awakening to their beauty, strength and resilience. There is a double spread at the end which includes the index, on all kinds of things one can do connected to trees, and the games that can be played with fallen leaves, branches, and whatever else comes from a tree. 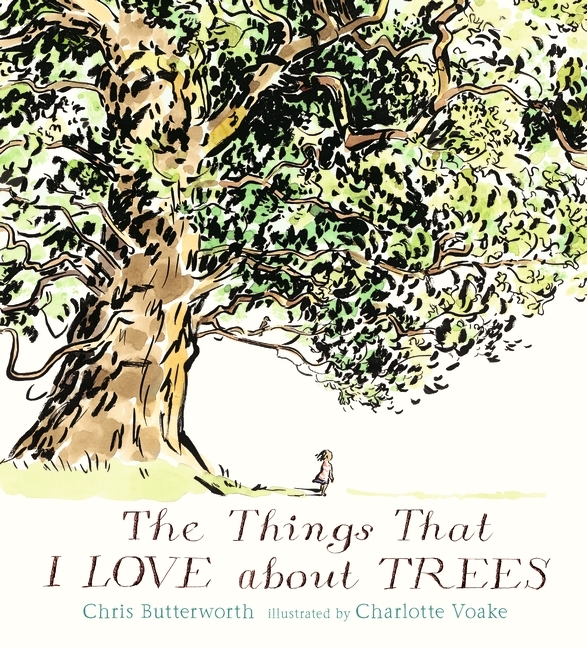 Thank you for alerting me to this book - I adore Charlotte Voake and books like this which have quiet but important things to say about our world.